I grew up in Philly but I live in Delaware now. I was raised Catholic (K-12) but lived in Hunting Park, a tough section of North Philly. I like to cook, especially recipes that my Grandmother cooked for me. I've traveled around the U.S. and also visited Spain and Puerto Rico. How would you describe your style in art? 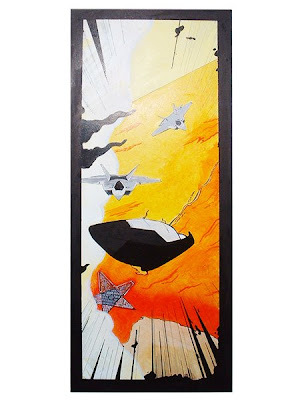 Science fiction greatly inspires my art. I have a bent towards "Hard" Science Fiction- I like to research my subjects and depict futuristic elements that can be backed up with current science. I do two kinds of painting. 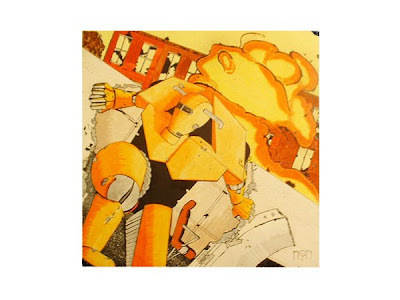 I do works on paper using ink and watercolor. I also do acrylic and ink on board. Did your family encourage you to be an artist? My grandmother encouraged my art big time. (Everyone else...not so much.) My grandmother was the first to recognize my talent. She watched me draw cartoon characters at an age when other children were still scribbling. Do you have something lucky/a ritual you do when working or before an art show?Yeah. It's called "last minute crunch time." A week or so before a show, I become a hard person to live with, until I'm finished everything. Do you have any additional interests aside from art and painting? I created a theme called 8008. All of my work fits into a narrative. I intend to tell this story with images, words and sounds. So far, the images (my paintings, etc.) are coming along well. I am currently working on a short story that's a prequel to my paintings. I've begun work on a graphic novel. Everyone keeps telling me I "have to do the graphic novel." I appreciate the enthusiasm but It's just going to take a lot of time and effort. I need everyone to be patient. Who (artists and non) are some of your role models and why? When I was in high school I was really impressed by Gauguin and Magritte. Post-Impressionism became my favorite artistic period. I drew from those artists in my earlier work. While in college, I went to see the Francesco Clemente retrospective at the Guggenheim. His watercolors floored me. I bought a watercolor set on my way home that night.Also, comic books are a big influence. I've always been a big fan of Daredevil. I couldn't take my eyes off of the covers David Mack did for DD in 1999. In 2001 Alex Maleev started his amazing run on DD. I met both artists at The Wizard World Philly Convention soon after. I told Alex that his art challenged me to be a real artist. I spoke with Marvel Editor-In-Chief Joe Quesada at that convention, too. Quesada said that the team of Bendis and Maleev were "the best team ever to work on DD." Quesada also said I had good taste in role models. How do you decide what subjects you choose to portray in your painting? It was really hard to make a decision on subject matter. I read a lot for about ten years- on all kinds of subjects that interested me. I kept up on current events. Finally, I noticed something. Every book I read and every subject I kept up on, caused me to speculate on humanity's future. So, I decided to depict the future I see growing from what concerns me today. What is your absolute favorite thing to eat? Breakfast. Any time, any place. I love breakfast food. What color best describes you/fits your personality and why? Orange. I love Autumn. When I look out and see orange in the trees i feel good. Do you have a website where fans can check out your work? Tell us about yourself and what your company does. I'm the co-founder and CEO of Eco-Libris (http://www.ecolibris.net/ ), a green business that works with book readers, publishers, authors, bookstores, and others in the book industry to balance out the paper used for books by planting trees. Millions of trees are cut down annually for virgin paper used for the production of books sold worldwide. We want to raise the awareness to the environmental impacts of using paper for the production of books and provide people and businesses with an affordable and easy way to do something about it: plant one tree for every book they read, sell or publish. 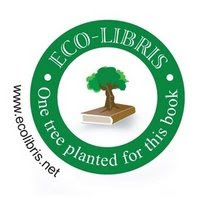 Customers also receive a sticker made of recycled paper for every book they balance out saying “One tree planted for this book” and can later display these stickers on their books' sleeves. Publishers can use our logo in their cover designs to indicate one tree is planted for that book. We have partnered with three highly respected US and UK registered non-profit organizations (SHI, AIR , RIPPLE Africa) that work in collaboration with local communities in developing countries to plant the trees. These trees are planted in high ecological and sustainable standards in Latin America and Africa, where deforestation is a crucial problem, and planting trees not only helps to fight climate change and conserve soil and water, but also benefits many local people, for whom these trees offer many benefits and an opportunity for a better future. About me: I spent a few years in financial management and business development positions and also served as an advisor to the Israeli Minister of the Interior. Afterwards, I co-founded Hemper Jeans, an eco-fashion jean company focusing on producing fashionable jeans made of hemp. I write on green business for the second-largest newspaper in Israel (Ma'ariv). I hold an MBA from Tel Aviv University and live in Delaware with my wife, Peleg and our baby Shira. Besides developing, writing on and breathing green business, I like playing soccer and watching Woody Allen films and old episodes of Seinfeld. Do you find that it is difficult to be an entrepreneur in your business in this day and age? I think it's a great time to be a green entrepreneur. It's still very challenging but there's already a lot of awareness to the need for change and you see more and more people and businesses that are looking for ways to go green. Maybe in 2-3 years it will be even easier, but I think that timing is very important, especially when you're an entrepreneur with an innovative service or a product, and now it's definitely the right time, at least for me, when it comes to greening up books. Is it hard to get some of the bigger businesses to get really interested in helping the environment? Yes. But I guess it's much easier if you compare it with 2-3 years ago, when the environment wasn't such a mainstream issue. A lot has changed in the last couple of years and I believe that the big businesses will get more and more familiar with environmental issues when they see that by helping the environment they also help their bottom lines. I think that regulation, such as giving carbon dioxide a price, would contribute to this process as well. Are you involved in art at all or any other clubs outside of your company? Unfortunately, no. I wish I had more time. What motivated you to get involved in this business? My strong belief that green business can make a difference and my love of books and trees. I wanted to establish a green business that would become an agent of change and would help move the book industry towards sustainability. I knew it would take some time to get to the point where all books are made in an environmental friendly manner, and I wanted provide people and businesses with a simple and affordable tool to do something about it in the meantime: plant a tree for every book they read, publish, write or sell. What do you think is the best environmental knowledge you could share with others that could impact them to make a difference? Where did you go to school? Did you gain anything from the experience? I went to school in Israel. I mainly gained good friends and the love of playing soccer! If you weren't in this business, what do you think you would be doing as a career? Maybe become a full-time journalist (I do it now as a freelancer). I love writing articles for the newspaper - it's very challenging, but also fun. Another option would be to write travel guides (green travel of course!). I've always envied the guys who write these guides. Do you have any advice for other people hoping to become entrepreneurs and start their own company? Do it because you love it and not just because you think it's worthwhile; otherwise it won't work. Try to have some fun on the way and be patient!